Ever since I posted a video on my YouTube channel about the $400 to $29,000 trade, you as viewers have demanded to hear from this trader! Well, here he is! 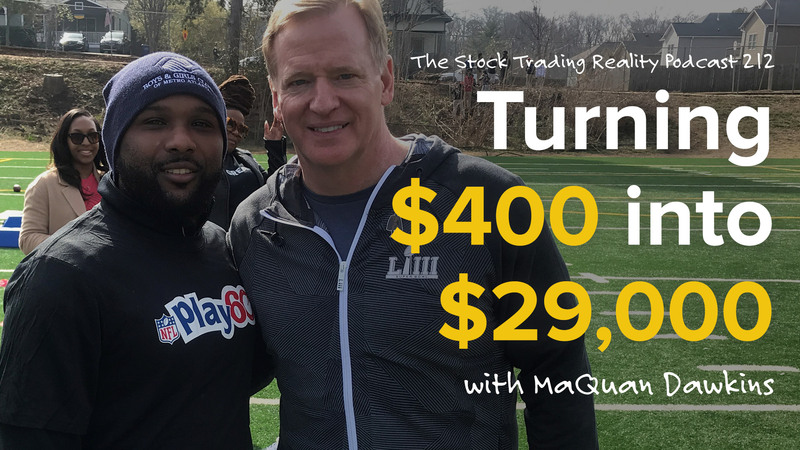 Our guest, Maquan Dawkins, took some time out of his extremely busy schedule to share his journey with us… including the massive winning trade he scored. While I realize it is easy to get caught up in the hype of such crazy numbers, please keep in mind the underlying themes here of just how much work and effort Maquan has put into his trading strategy. He is by no means throwing darts and certainly is not doing the whole “go big or go home” approach. Once in a while though, the market does give you BOOMS in your favor. Maquan is a high energy guy, so be ready! Let’s GO! Today we talk with community member MaQuan. His introduction to the market was before 2008. He was friends with the president of a bank who would talk often about the market. While his friend tried to explain the market to him, he never fully grasped it at the time. After changing location and taking a pay cut, his fiance suggested he focus with much more intent upon trading. After looking around the education landscape, he ran into someone offering a program for $20,000 but he thought that was ridiculous. MaQuan invested in the University package and began working through aspects he wanted to focus on. The problem he had was his consistency so he developed a seven-step strategy that should shape what kind of volatility his portfolio will have. While he didn’t paper trade using a platform, he mentally tested his strategy over time with lots of reviews after the market was closed. A big reason for his fluctuating results earlier was not utilizing the same amount of capital per trade. Now all of that criteria is part of his seven-step strategy. He’s never going out looking for home runs. Base hits add up fast. Fund an account with no education. Find stocks with no education. Buy stocks with no education. 2015 was a good year for me. My strategy wasn’t there so I couldn’t duplicate what I did right. Because of my job I don’t have a lot of time to sit and watch the trades. That’s why I had to form a strategy that fits for me. I’m a football player, Clay. That’s how it works. My brain is looking at a set of plays they run and the percentages. That’s exactly how I work in the stock market.